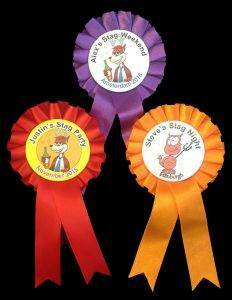 Stag Night Rosettes can be quickly produced to your design requirements. The centre of the rosette is based on a 57mm diameter badge. The designs that are available are shown on the web site. All you need to do is decide which designs you prefer and then let us have the wording and colour scheme that you want for your rosette centre. The rosettes are produced in-house by us, so we can make them with whatever combination of ribbon colours you require. So the colours could match a colour scheme for a favourite club or football team. If you wish you can have the names of the individual guests on either the centres of the stag night rosettes or on the tails. The rosettes are available with one, two or three layers of ribbon. You can also select the number of, and the colours of the rosette tails, and have them custom printed if required. When you get on to the ordering page, you will see our rosette previewer, where you can select the rosette centre of your choice and then decide on how many layers of ribbon you require, what colours you require and how you want the tails to appear Once you have seen the result you can easily transfer this across to the order form where you just need to add the specific information that we need to know for customising your order – names, event, dates etc. 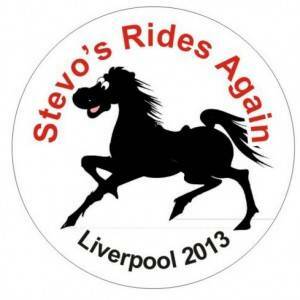 ou can have the names of the individual guests on either the centres of the stag night rosettes or on the tails. The rosettes are available with one, two or three layers of ribbon. You can also select the number of, and the colours of the rosette tails, and have them custom printed if required.